If you are unsure if we deliver to your postcode area, please click on 'estimate shipping and taxes' in your shopping cart and enter your postcode. We regret that no offshore delivery is available at this moment. How long will I wait for my order to be delivered ? Orders of 25kg parcels are sent out via courier,FedEx and UKMail. Please allow up to 5 working days for delivery. Orders over 250kg Plus are sent out on pallets using a National pallet delivery service. Please allow 7 to 10 working days for delivery. It is very important to read the full Delivery Policy to ensure Pallet deliveries can be made successfully; if you have any concerns about delivery please contact us on 01946 820412 for more information prior to placing your order. • Pallet deliveries are made via a National pallet distribution on a kerb side offload delivery only. • Pallets are generally off-loaded using a tail lift and positioned using a manual pallet truck,these pallet trucks can only offload onto flat, solid surface such as concrete or tarmac. • Manual pallet trucks can not operate on slopes, earth, gravel, grass or similar surfaces. so we can only provide a road or kerb side delivery. • Please ensure there is no obstructions such as low bridges, parked cars or hanging cables. Ensure there is a solid surface such as concrete or tarmac to offload on to. • A 1,000kg pallet is heavy, Please make sure you have permission to have goods left on a kerb or road side delivery, we cannot accept liability for any damage arising from delivery. 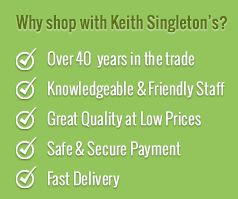 Where deliveries cannot be made due to insufficent access before or at the point of delivery, or unsuitable offloading surfaces, obstructions and insufficent delivery details provided, a charge of £40.00 per pallet will be imposed for re-delivery or return to Keith Singleton Horticulture. Please click on the link below for a video on how pallets are delivered. How do I add a different delivery address? You will be given the option to use a new delivery address at the check-out stage of your order. In accordance with the EU distance selling directive you have the right to cancel your order up to 7 days after receipt of goods. The goods must be unused and complete with the original packaging, tags, and in a saleable condition. Once the condition of the returned goods has been inspected we will issue a refund or exchange within 30 days. Please quote your order number in all correspondence with us. We must be informed of any damaged goods within 3 days of receipt, or the customer can refuse to accept any damaged package from the courier. We will charge the postage costs to return any exchanged goods if it is the wrong size or colour etc. Unfortunately erroneously ordered goods cannot be refunded or exchanged after the mandatory 7 day period. When returning good please make sure you use a secure method of postage as we cannot be held responsible for lost or damaged goods in transit to us. Finally, customer satisfaction is always our aim. Please do not hesitate to contact us should you have any problem with anything ordered from us.